The Philippines Solidarity Network Aotearoa is very concerned at the arrest of the leftist Anakpawis Party's Congressman, Crispin Beltran in the Philippines. PSNA have asked Helen Clark to intercede with Philippines President Arroyo on Beltran's behalf. The PSNA toured Beltran here in 1999, as long time head of the Kilusang Mayo Uno, the Communist Party of the Philippines' aligned trade union grouping. Beltran became president of the "Yellow Taxi Drivers’ Union and the Amalgamated Taxi Drivers Federation from 1955-1963. From 1963-1972, he was Vice-administrator of the Confederation of Labor Unions of the Philippines, and then vice-president of the Philippine Alliance of Nationalist Organizations which became the Alliance of Nationalist Genuine Labor Organizations, affiliated under the Kilusang Mayo Uno (KMU) whose establishment on May 1, 1980, signaled the labor movement’s all-out war against the Marcos dictatorship." He and several other union leaders were arrested by the military in 1982, but Beltran escaped and spent two years underground with the Communist Party's "New People's Army" in Central Luzon. Beltran adopted the "nom de guerre" of "Ka Anto" during this time. 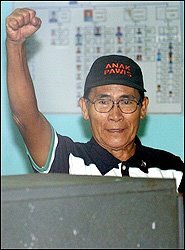 In 1990, "Ka Bel" as he is popularly known, was charged in February 1990, by the Toledo City prosecutor, with "illegal association with the Communist Party of the Philippines".